Do You Need Guitar Pedals? Keep reading to find out the pros and cons of running effects pedals, tips on when they’re required and some recommendations for get started. This is especially relevant if you play in a band (most certainly if you’re also playing live shows). When playing in a band, you’ll often want that lead line to cut through the mix or your clean tone to be brightened up a bit. In addition, you’ll most likely need to switch between a variety of different sounds without being able to manually adjust your amplifier settings. Having better control over your sound is especially useful when you play live. You’ll find yourself playing with a variety of different backlines in a variety of different rooms on a regular basis. If the distortion on someone else’s amp is a bit too harsh, a dedicated pedal can help you achieve the tone you want. If the venue’s acoustics muddy up your tone, a treble booster can really help you hone in on a clearer sound. In many cases, a certain effect can add a whole new dimension to a piece of music and provide a significant amount of creative inspiration. If you’re working on music that feels like it needs a certain something to bring it to life, experimenting with a range of effects is a great way to go. Additionally, effects pedals can really engage an audience in a live setting by showcasing variety. If a lot of your parts are similar, effects pedals are a good way to liven them up and make them distinguishable. There’s no doubt that effects pedals are a huge amount of fun and a hobby in their own right. The possibilies to expand and develop your sound are endless when it comes to pedals and there’s always something new to try out. 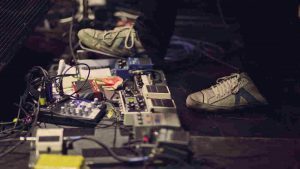 Many beginner guitarists are put off by the staggeringly-large pedalboards that many guitarists use, thinking a huge number of effects pedals are required to get started. However, it’s often the case that the guitarist-in-question simply collects pedals as a hobby and for their own personal development. As we’ve just discussed, effects pedals are phenomenal for creative development and are a hobby for many. However, good pedals are not cheap and the cost can rack up quickly. A starter setup (featuring three pedals and the board itself) will run you around $200-$300, whilst additional pedals will cost an average of $50-$100 each. In addition, you’ll have to buy batteries on a regular basis (unless you use a power supply). Whilst a good set of pedals can be a fantastic long-term investment, understand that they will set you back a few hundred dollars. It could be argued that playing directly into an amplifier gives you very little to hide behind. Mistakes, timing errors and poor tuning/intonation will stick out like a sore thumb, forcing you to fix the problem at the source. Whilst certain effects might disguise errors, doing so might hold your technical development back by giving you something to hide behind. In addition, whilst effects pedals do have significant potential for creative inspiration, it’s possible to end up at the other end of the spectrum and rely on effects to vary your parts rather than your technique. Understandably, many guitarists simply want to ‘plug in and play’ without having to spend five or ten minutes setting up pedals and adjusting levels. Additionally, a pedalboard requires some ongoing maintenance; batteries will run out, cables will die and pedals may malfunction. Whilst the setup & maintenance for a pedalboard isn’t substantial, it does require additional time. If you’ve decided the pros outweigh the cons, here’s got a few essential recommendations to get you started. Buying a dedicated pedalboard significantly reduces your setup time and stops your pedals from sliding around every time you stamp on them. The best value pedalboard I’ve found is the Vangoa 19.8″ X 11.5″ Pedalboard (link to Amazon). It’s sturdy, substantially-sized and comes with everything you need to get started (including a carry case). A good chromatic tuning pedal is far more reliable and easy to use than a cheap headstock tuner. Additionally, it can also double as a bypass to cut off your signal whilst you’re not playing. The best value tuning pedal I’ve found is the Korg PB01MINI (link to Amazon). It takes up minimal room on your pedalboard whilst packing a well-sized display. Having a dedicated overdrive or distortion pedal gives you much more control over your sound and enables you to switch from clean to distorted tones with ease. However, many guitarists are unsure if they’re better suited to either distortion or overdrive. An overdrive pedal (whilst still a type of distortion) simulates the natural saturation of the valves in a tube amplifier. It’s much milder and more natural sounding than a distortion pedal, often being described as a ‘crunch’ sound. It’s well-suited to genres such as blues, classic rock, folk and country. My favourite overdrive pedal is the Boss SD-1 Super Overdrive (link to Amazon). This pedal is an absolute classic and achieves a great natural crunch sound. A distortion pedal provides a much more saturated, clipped and harsh sound than overdrive does. It works really well for hard rock and metal genres. My favourite distortion pedal is the Boss DS-1 (link to Amazon). This is another classic and works perfectly for rock and metal. A boost pedal essentially adds more gain to your signal before it reaches your amplifier. Therefore, you get a volume boost without any additional distortion. A boost pedal is strongly recommended if you play lead parts or solos as it’ll help them cut through the mix. The best value boost pedal I’ve found is the MXR M133 (link to Amazon). It’s adds a really clean boost to your tone and also allows you to switch guitars with unmatched volume output. My final recommendation for a starter setup is a reverb pedal. The reverb effect simulates natural reverberation (sound being reflected off of a physical object). Reverb adds a fantastic sense of definition and depth to your sound, resulting in a much more rounded tone. My favourite reverb pedal is by far the TC Electronic Hall Of Fame 2 (link to Amazon). This pedal features a wide range of reverb models and gives you complete control over every aspect of the reverberated sound, which is especially useful in a live setting. In summary, guitar pedals of course aren’t necessary for every guitarist. If you aren’t playing with others or in a live setting and are content with the tone you’re currently achieving, a pedalboard might not be necessary. 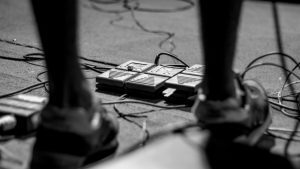 However, pedals are thoroughly recommended if you play in a band, play in a live setting or are simply looking to expand and develop your sound.